I hope I got you sufficiently excited about security envelope patterns, that you've started saving them. This project utilizes as many patterns as you can get a hold of. Remember how excited my whole family has gotten about saving our envelopes? This enthusiasm led to sorting and matching. A four year old's favorite activity! We decided to make our patterns into a matching-memory game. Because the patterns are so complex and similar in color schemes, it's a game with some challenge. An advanced memory game, if you will. Yes, it's fun for all ages over 3 or 4. I think it makes a great little gift to stuff in a stocking or bring for a child at a holiday party to keep them engaged. 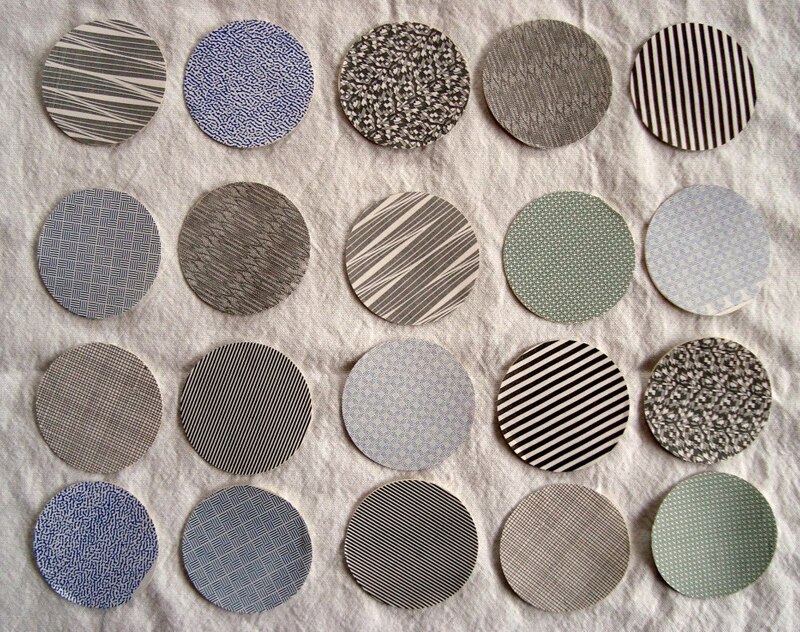 Cut out two of each pattern in whichever shape you choose. 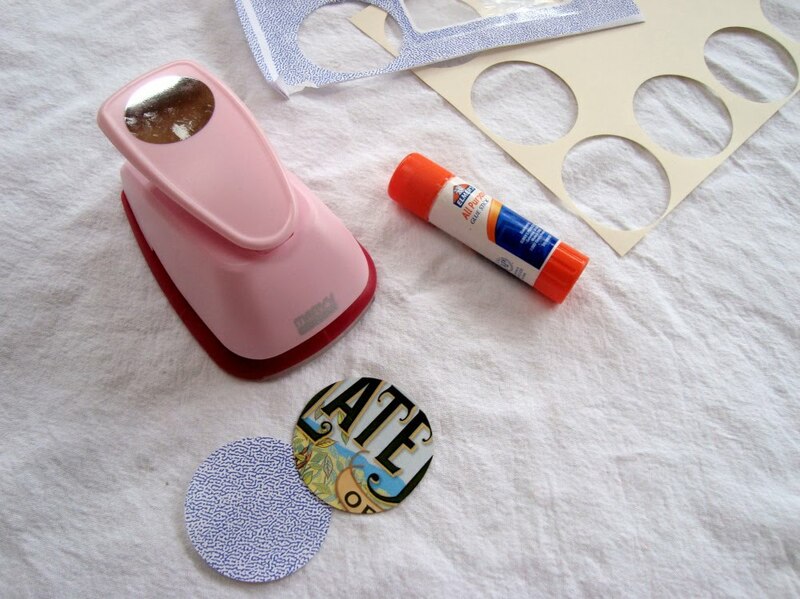 Cut out a corresponding piece in card stock or a cereal box for each pattern piece. Add paste to card stock and adhere pattern. If you use a box, make sure the graphics side is the one that you apply the paste to. You want the back of each memory tile to be uniform. I made a little gift basket/ game holder with a scrap from a felted red sweater. 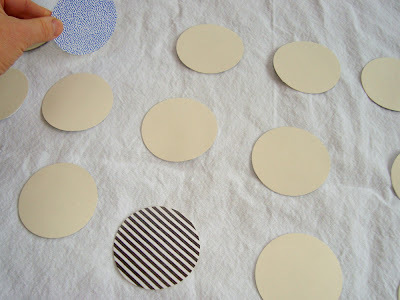 Cut a circle larger than your tiles. Take a long strip of felt (measure to see that it fits around the perimeter of your circle)and fold it in half. Sew up a little seam at the edge to make a "cuff". 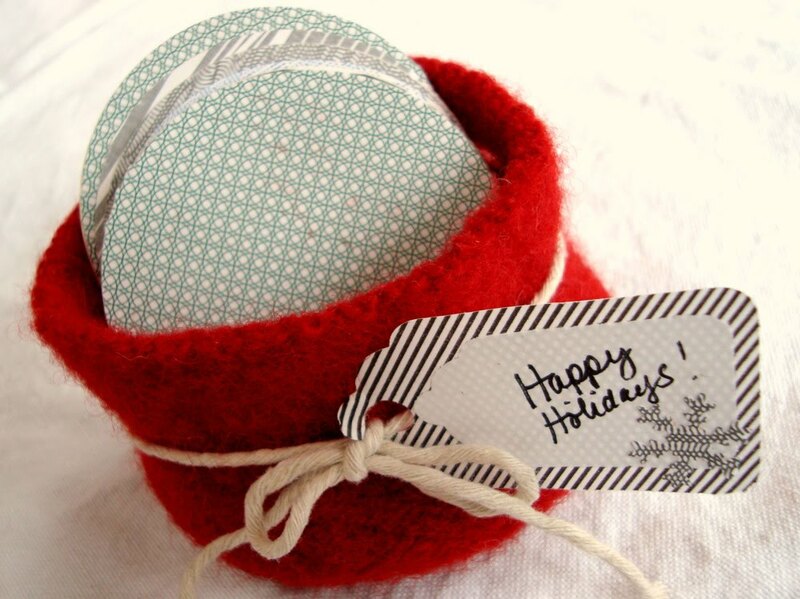 Attach this cuff to your felt circle and turn inside out. Done! Have fun with this one... we certainly did! Love it! I've been looking for simple homemade Christmas gifts! Brilliant idea once again! These would make great stocking stuffers for the kids. Great idea! 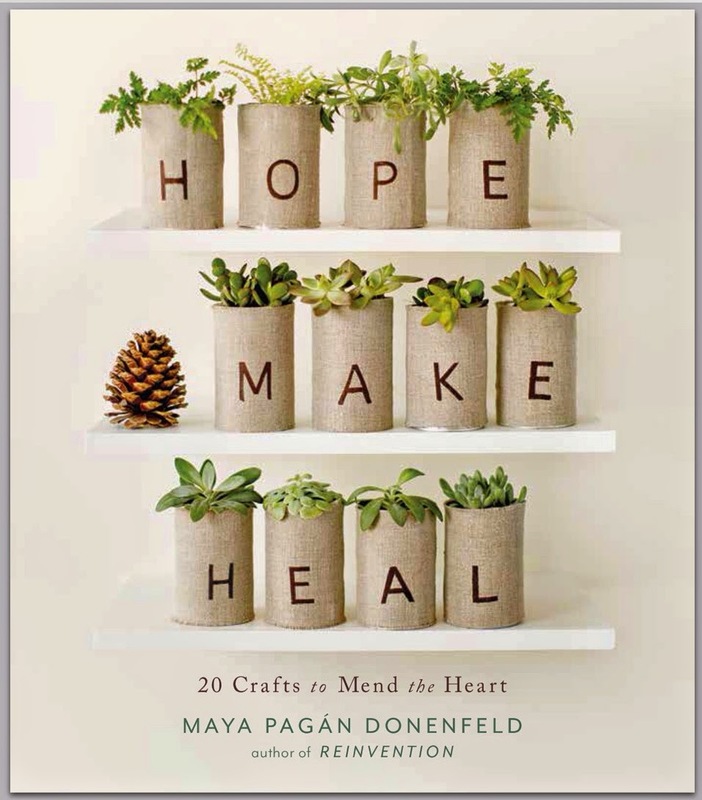 I love gifts made of paper--and how nice to have it both upcycled and made with interesting patterns. Beautiful and brilliant. I am inspired! I may not have security envelopes, but I'm certain I can find some repeating pattern images to make a set for my daughter. Somehow I missed your security envelope post ... I must admit I never really noticed the insides before. What fun! I also made a memory game this year using photos from an old childhood book. There are two things I love about your version. 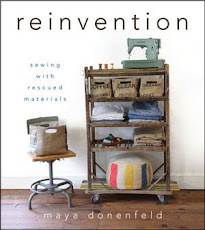 1) It is completely recycled - how cool is that? and 2) the felted basket is so wonderfully festive. This is soooooo cute. I'm totally thrilled! Congratulation!!!! hola maya! l love your blog!! !this idea is lovely lovely!! !me encantó!!!!besos!! I have indeed been saving my security envelope papers. I open junkmail and instead of going "ugh" more often say "ooh!" Good idea - we love memory games here, so we'll have to make this. I'm with Shalet! I'd never noticed until you post the other day... Our school is having a bookfair and all the children are bringing their money in envelopes.... I'm the cashier so after they buy and spend their money they leave the envelopes with me! It's only been a couple days and I have quite the collection!! Thanks for the wonderful inspiration!! Every single time I come here, Maya I'm just blown away by your brilliance! Another sweet, simple, completely amazing idea. memory is my son's all time favorite game and we play it EVERY FRIGGIN DAY. so this idea is very appealing. as is that circle puncher thingy. must get me one of those. Love using security envelopes for notes but this just takes that one step further. This is fantastic. My 5 year old loves this game. I'm so going to make her one! 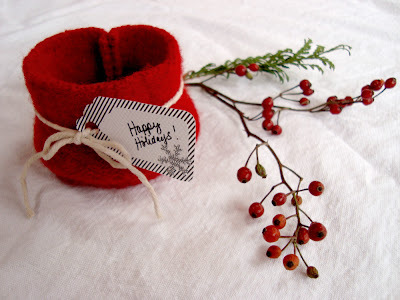 Love the little gift sack too. This really was simple gifts...I was looking for some handmade Gift Card envelopes...I hope you will do something on it.